Sales for Gilt allows you to browse all of the current sales and products for Gilt.com. Available information includes: manufacturer, original price, sale price, materials, sizes and quantities remaining. 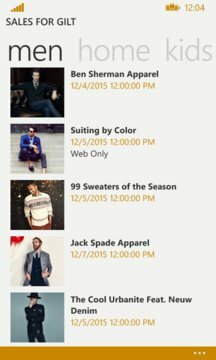 Once you are ready to purchase, simply hit the Purchase button to login and purchase through Gilt. Gilt provides insider access to today's top brands for women, men, kids, and home as well as local experiences, amazing getaways, and gourmet finds - at up to 60% off. One night, while watching television, I saw a commercial for Gilt. As a long-time customer, I was excited to see them thriving. At the end of the ad they said, "Download our mobile app!" As I had both my phone and my Surface next to me, I checked and found no such app. What is one to do? As a developer, the next thing I looked for was an API. Happily, I found one and immediately went about exploring. 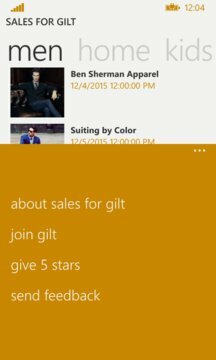 I knew I must write this app for them, and Sales for Gilt was born!